Military bases are beginning to convert aging lighting systems to LED to achieve high levels of efficiency and reliable, long-term performance. LED lighting offers advantages for the many applications typical of most military installations, most notably energy efficiency and reduced maintenance. As example, many LED fixtures are rated for 100,000 hours vs. 24,000 hours for high-pressure sodium (HPS) and 10,000 hours for metal halide. URS is a national energy management firm that specializes in generating efficiency and cost savings for our clients through programs like LED lighting retrofits. URS has developed relationships with the leading LED lighting manufacturers to bring real estate owners and operators the best products with the most competitive pricing to lower electricity costs across their portfolios. URS works with the leading real estate investment firms nationally and increases their bottom line results by better managing energy costs. URS was asked by one of the largest private managers of military housing to design and execute an LED retrofit solution and provide energy procurement services for a military housing project. 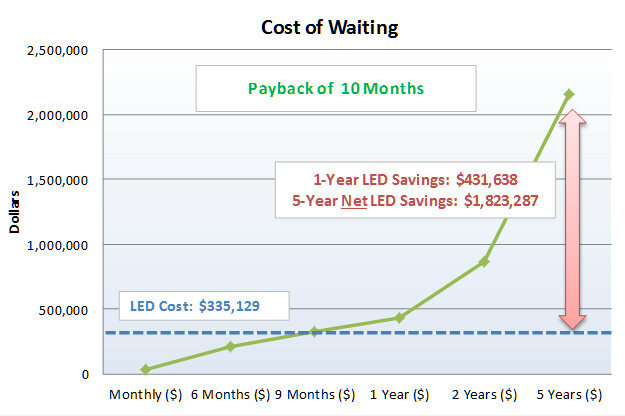 The LED lighting retrofit resulted in an increase in asset value in excess of $8.6 million dollars.